EuroPris is a membership organisation that obtains its income from annual membership fees and through financial support from the Criminal Justice Programme of the European Union. Members of EuroPris are national prison agencies across Europe. In accordance with the EuroPris statutes, European countries from the Council of Europe region can join EuroPris. EuroPris relies on the contribution and support from its Members to become a sustainable organisation with greater financial independence. Our Members contribute a membership fee based on a gross-domestic product tiered structure. With this differentiation in contribution EuroPris wants to ensure that all countries, including those currently experiencing financial limitations, will not face a financial hurdle to becoming members of the organisation. Members of EuroPris benefit in a variety of ways through our supportive network which facilitates communication between national prison agencies and encourages collaboration and information sharing to address the many practical, unique (and often difficult) issues that we face in our daily professional work. Members can take part in EuroPris related activities such as workshops and expert groups, they have the ability to access our Register of Experts for advice to specific questions, and Members can access our internal resources and systems for information sharing. 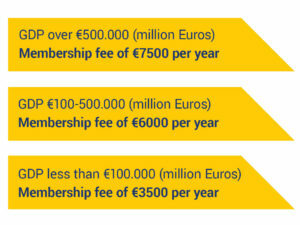 Membership with EuroPris can also bring a financial advantage through the reimbursement of travel and accommodation fees for attendance of our events and activities. Our membership is expanding quickly with a number of national prison agencies having already joined our Organisation. We aim to strengthen our network through the continued collaboration with our Members and we will strive to be as inclusive as possible to ensure that all national prison agencies across Europe can join us in the shared interest of enhancing prison and correctional services.